John McLemore is a cookbook author and the man behind Masterbuilt. He was in the kitchen with Rachael Ray to show off two ways to fry a turkey. Try this Savory Fried Turkey or look at the Roasted Pecan Deep-Fried Turkey Breast as another option. McLemore talked Rachael Ray through the process of making the injectable marinade that is full of savory flavors. In total, he said you should inject around one ounce per pound of meat, but follow the instructions to make sure you spread it into all areas of the meat. He explained that a whole turkey fries in about four minutes per pound. 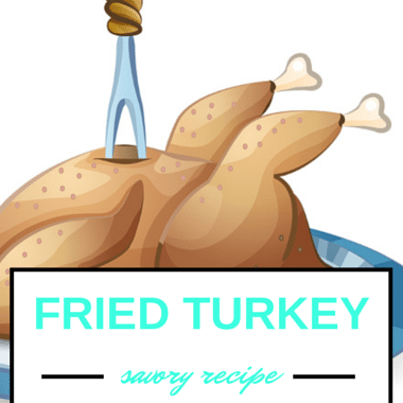 Have you ever tasted fried turkey? Thaw the turkey if it is frozen. This will take about 24 hours per four pounds when thawing in the fridge. Place peanut oil in the fryer and heat it to 375 F.
Remove neck and giblets from turkey. Also discard pop-up timer and plastic leg holder, if included. Rinse turkey using warm water (or soak in warm water for half an hour). Pat completely dry using paper towels. Bring chicken broth to a boil in a saucepan. Reduce heat to low and add the rest of your ingredients. Simmer and stir for about five minutes. Let completely cool. Whisk everything to ensure it is smooth. Transfer liquid to a marinade syringe. Inject about 4 oz into each breast, and about 2 oz into each of the legs and thighs. Sprinkle the outside of the bird with salt and pepper. Place turkey, breast side up, in the basket of your fryer. Slowly lower the turkey into the oil. Fry the bird for three or four minutes per pound. Slowly lift turkey out of oil and test with a meat thermometer. Turkey is done at an internal temperature of 165 F.
If turkey is not fully cooked, return it to the oil for another five minutes before checking the temperature again. Let rest and drain in the basket of your fryer for around 10 minutes. Then transfer to a cutting board to carve it before serving.